His practice areas and experience cover commercial intellectual property advice, IP litigation, advertising law and litigation, advice on drafting and/or negotiation of information technology agreements on seller or buyer side, and advice on the protection and enforcement of trade mark, patent, copyright and industrial designs. He practices across Africa and also acts for clients in intellectual property infringement actions, anti-counterfeiting raids, due diligence investigations and reports, drafting of licensing and franchise agreements, trade mark oppositions, trade mark cancellations, and domain name dispute resolutions before World Intellectual Property Organisation (WIPO). John is regionally and globally renowned for his excellence in the IP space, and has received several top citations and recognitions from international directories such as Chambers Global, World Trademark Reviews, IP Stars and WIPR Leaders. He advises clients on IP issues arising within the financial services, manufacturing, IT, telecommunications and pharmaceutical sectors. He also runs a very busy filing practice (trademarks, plant breeders rights, designs and patents) across Kenya, Uganda, Tanzania, Rwanda, Burundi, Ethiopia, and Sudan. 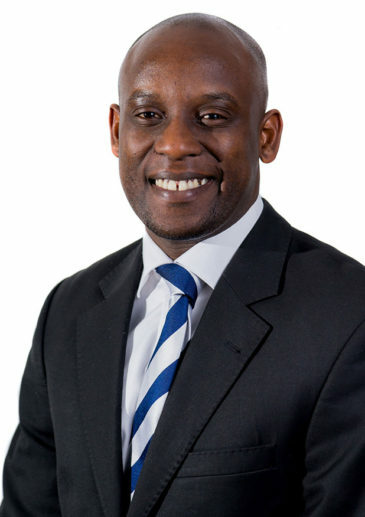 John also handles trademark opposition and cancellation actions before the Registrar of Trademarks in Kenya as well as domain name disputes on behalf of clients of the Firm. John Syekei is the convener of the Law Society of Kenya – Nairobi branch ICT and IP liaison committee. He is also a member of the Licensing Executives Society International, International Trademark Association (INTA), International Federation of Industrial Property Attorneys (FICPI), International Bar Association (IBA) and Law Society of Kenya Intellectual Property Rights and Information Technology Committee. John is an Advocate of the High Court of Kenya as well as a Patent Agent, Commissioner of Oaths and a Notary Public. He holds a LLB from Moi University. Advised ADIDAS GmbH in relation to filing a counterfeit action before the Kenyan Anti-Counterfeit Agency resulting in the successful raid, seizure and destruction of a consignment of counterfeit products at the Port of Mombasa that were infringing on the protected trademark rights of ADIDAS. Advised Glaxo SmithKline in relation to filing a counterfeit action before the Kenyan Anti-Counterfeit Agency and the Commissioner for Customs resulting in the successful raid, seizure and destruction of a consignment of counterfeit products infringing on the protected trademark rights of GSK. Advising Microsoft Corporation on legal compliance issues in software counterfeits. Advised Reed Elsevier (UK) Limited, trading as Lexis Nexis, on filing a counterfeit action before the Kenya Anti- Counterfeit Agency which resulted in a successful raid and seizure of counterfeit book sets infringing on the Lexis Nexis copyright. Advising Blount Inc, an Oregon based global agro- tools manufacturer, in several anti-counterfeit mandates over the past 3 years across the country. Advising Diageo on an anti-counterfeit matter in Rwanda in relation to its JOHNNY WALKER whisky brand that originated in Dubai. Successfully acted for Nairobi Java House Limited in a High Court Civil Appeal in Kampala, Uganda in an appeal against the decision of the Registrar following trademark opposition proceedings. Acted Eaton Towers in appeal in the High Court Civil Appeal Court in Kenya against ruling of the Assistant Registrar of Trademarks allowing opposition against registration of the “EATON TOWERS” mark. Acting for Diageo Brands B.V in opposition of the registration of the BLUE LABEL. Acted Google Inc in opposition proceedings relating to its “BEBAPAY” trade mark. We acted for Sony Corporation in appealing in the High Court Civil Appeal against a ruling of the Assistant Registrar that allowed the Applicant’s mark to proceed for registration. We acted for Diageo Brands B.V in a suit in the High Court of Kenya against Platinum Distillers. Instructed by Kenya Airways to instigate arbitration proceedings in order to obtain ownership of the domain name www.kq.com. The arbitration was conducted within the auspices of the WIPO domain name dispute resolution centre. Acting for Diageo Brands B.V and EABL International Limited, in close coordination with the Trust Law Chamber in Rwanda to assist the initiation of prosecution against suspects in counterfeit goods. Acted for Disney Enterprises Inc. in a filing opposition for the MICKEY MOUSE & logo mark. Acted for Marvel Characters Inc. in a filing opposition in relation to the ULTIMATE SPIDERMAN & Device mark. Acted for Procter and Gamble in advertising and competition law litigation by defending a suit filed by Unilever relating to the OMO and Ariel brands. Acted for Bidco Oil Refineries Limited in a litigation matter with Mt. Meru Limited in Zambia. We advised Starbucks and defended it in respect of demands made by 3 individuals depicted in a mural in various Starbucks stores. Advised and undertook a trademark filing project on behalf UAP with respect to its various trademarks. Jurisdictions: Kenya, Uganda, Tanzania, Rwanda, Burundi, South Africa, Sudan, South Sudan, Mozambique, Angola, Nigeria, Ghana, Zambia, Ethiopia, Zimbabwe, Gabon, Cameroon, Senegal and DRC. Advised and acted on several trade mark registration projects in Pan-Africa for Equity Bank of Kenya and its associated company Finserve Africa Limited, including Kenya, Uganda, Tanzania, Rwanda, Burundi, South Africa, Sudan and South Sudan. The work entailed providing advice on filing and registration strategies in these markets. Undertook an Africa-wide trademark filing project on behalf of Alliance for a Green Revolution in Africa with respect to its various trademarks. Jurisdictions: Tanzania, Uganda, Kenya, Zanzibar and Ethiopia. Assisted in advising and undertaking trademark filing project on behalf of Cheki Africa Media with respect to its various trademarks. Jurisdictions: Ghana. Assisted in advising and undertaking an Asia and East Africa trademark filing project on behalf of ION Kenya Limited with respect to its various trademarks. Jurisdictions: India, Kenya, Uganda and Tanzania. Assisted in advising and undertaking trademark filing project on behalf of Chemi & Cotex with respect to its various trademarks. Jurisdictions: Kenya, Uganda, Burundi, Ethiopia, Rwanda, Zambia and Malawi. Advised Microsoft EA Limited on the setting up of an ‘IP Hub’ which is a technology ‘space’ or forum to assist young software developers to understand intellectual property and be aware of the means available in law to protect the IP in their software so as to ultimately enable them to commercialise their IP from a point of knowledge in terms of value of their IP. Advised Kopo Kopo Inc, an American entity from the Bay Area of San Francisco (Silicon Valley) as a merchant aggregator for MPESA’s buy goods functionality on the regulatory landscape relating to mobile money, and negotiated contracts with Safaricom in relation to its MPESA platform and the establishment of a mobile phone point of sale. Advised on the drafting and negotiating of a co-operation agreement between Safaricom Limited and Seven Seas Technologies Limited for collaboration in the research and development of innovative technology products, including the use of cloud computing. Advised Centum Investments and Etranzact, a Nigerian mobile solutions and e-commerce provider, in the establishment of a local entity under a joint venture seeking to develop electronic payment solutions for East Africa. Chambers and Partners, 2018 ranked John in Band 1 for Corporate/commercial: Intellectual Property. Recognised by WIPR Leaders as among best and the brightest in IP private practice, 2018 edition. Chambers and Partners 2017 ranked John in Band 1 for Intellectual Property. John is ranked in the Gold Band by WTR 1000 in 2013, 2014 and 2015. Managing IP ranked him as an IP star in 2014 and 2015, a very highly regarded recognition within the IP world. Under John’s supervision, Coulson Harney won IP Team of the Year at the prestigious African Legal Awards in 2015. Legal 500 EMEA 2015 listed John as recommended lawyer. Kenya’s Alternative Dispute Resolution Policy For .Co.Ke Domain Names Is Now Active.